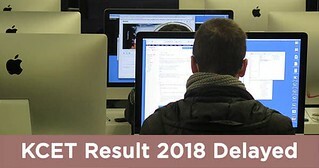 KCET results 2018 have been delayed as CBSE result for class 12 has been delayed. According to the source, if CBSE releases its class 12 result by the end of May 2018, Karnataka Examinations Authority (KEA) will release KCET result in the first week of June. Earlier, KEA planned to announce KCET 2018 result by 25 May, though, Central Board of Secondary Education did not release class 12 result at that time, and therefore KEA has to postpone Common Entrance Examination (CET) result. KCET merit list is based on two things; one is the class 12 result and second is the marks secured by the candidate in the KCET entrance exam. So a delay in the CBSE result has caused a delay in the KCET Results. A KEA official has said that KCET Result 2018 will be declared with a day or two of the release of the CBSE class 12 result. If the CBSE result is announced by 30 May, then there are chances that CET Karnataka result is declared on 1st or 2nd June 2018. The marks of the students who had appeared in the Karnataka state board exam is directly sent to KEA and updated, but in case of CBSE and ISC board, the students have to manually add their marks. The students whose class 12 marks are not available, they will not be allotted KCET rank. This year 1.98 lakh students have appeared for the exam and are waiting for KCET results. Karnataka Examinations Authority will release CET Rank list and seat allotment will be done on the basis of that. The candidates who appeared in CBSE and ISC needs to approach their marks to KEA so that the process of preparing rank list will be started however candidates from Karnataka PUC need not update their marks anywhere as KEA updates state board marks itself and prepare the rank list for KCET. Lakhs of students appear in KCET every year which is the common entrance test in Karnataka State for admission into Engineering, Architecture, and pharmacy courses. Delay in KCET result will also cause a delay in the process after the result announcement like counselling, seat allotment and admission. Students who appeared in Class 12 CBSE board are curiously waiting for both the result to be released soon. Lots of students apply for more than one exam, and it is important to know the result to decide while selecting the colleges and courses. However, the official dates will be announced soon for both the results soon. This year KEA is also planning to come up with an app for document verification which will make the whole seat allotment process fast and convenient. Until last year the student's had to go to the allotted centres for verification of the documents. Karnataka State Board (PUC) and ISC have already declared the result, and now Karnataka Exam Authority (KEA) is waiting for CBSE to release its result for class 12. KEA will prepare the KCET Rank list based on the qualifying marks and KCET Exam.